This is a highly-rated foundation on MakeupAlley and Youtube, and I’ve been using it almost exclusively for a little over 2 months, in both de-humidified chilly air-conditioned environments, and sweltering, rainy tropical weather. I’m pleased to say that this IS a great foundation, but there are a few things that you need to note before you take the plunge. What I think it is? This is semi-matte, oil-free, caused zero breakouts and sensitivities for my slightly-reactive skin, and does not clog pores. What I think it’s not? 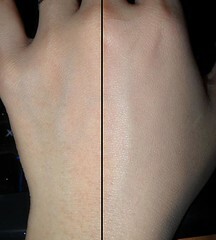 Full coverage, 16-hour, or toning in any discernible way. Best Applied With? Fingers. Really work it in for the most natural look. This is the best foundation if you have skin that borders on either side of normal on most days, and want a nice matte-but-glowing complexion. (By glowing, I mean like you have more even-toned and clear skin which light bounces off of.) If you are looking for a moist or super-matte finish, want opaque coverage, or have extremely dry or oily skin, stop reading this post. 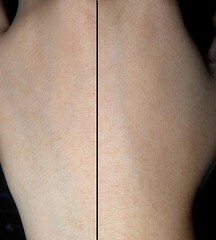 Do note the below images are taken with flash, and the foundation will be less visible in natural light. This is one of those foundations that you can wear without powder for a natural look, as it sets and does not slip and slide for the most part.The coverage feels light and uncomfortable, but it does do a pretty good job of evening out skin tone while looking and feeling natural. It has not oxidized on me throughout the day, but I don’t find it to be particularly build-able. If you layer on more and then blend, I found that it just spreads out to about the same coverage as before (see image below). It does start to sink more into your lines if you apply too much, so I’ve found that one coat is the best amount. If you need concealing, use concealer. Don’t layer on more foundation. Only some cream formulas work well that way. Best thing? 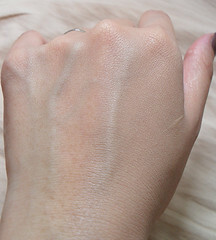 This looks good in natural light (below), where so many foundations tend to look unnatural. See how the darker “spots” (which are my hair follicles) are no longer visible? What I think it is? 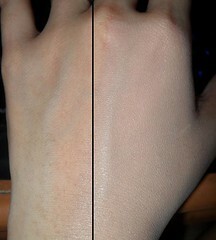 This is powdery, medium coverage undereye concealer that does a fair job, but is only slightly build-able. Like the foundation, the powdery silicone-based formula just spreads and sheers out if you try to apply more. What I think it’s not? A good cover-up for zits and serious dark circles. That said, it IS a nice feeling concealer if you don’t like sticky, creamy or heavy things under your eyes. This does not crease as much as heavier formulations tend to, and I like how it doesn’t feel like you have much on your face. Do note that the concealer is ever so slightly lighter in shade than its coordinating foundation, and like the foundation, I experienced no oxidization over time, so don’t buy anything too much lighter than your skin-tone unless yo need to neutralize dark spots. Recommended for those with normal to oily skin and mild to medium dark circles, as it is a matte finish concealer, medium-opacity, and is not peach enough to correct significant blue or purple undertones in the skin.